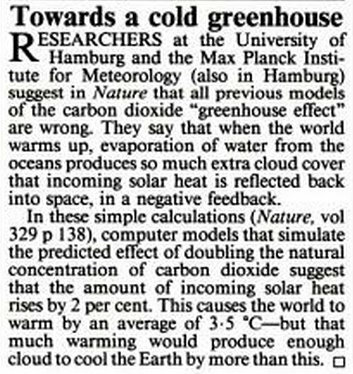 One year prior to James Hansen testifying to Congress in 1988 he was 99% certain that man-made global warming was occurring, a paper published in Nature indicated that global warming would cause negative feedback from increased cloud cover to cool the Earth by more than the alleged warming effect of CO2. E. Roeckner, U. Schlese, J. Biercamp & P. Loewe (1987), Cloud optical depth feedbacks and climate modelling, Nature 329, 138-140, doi:10.1038/329138a0. Thank you for the reference. Unfortunately, I was unable to find a free version of the paper online. Incredible! Mann uses upside down data again! Taxpayers Getting Scammed by Chevy Volt?